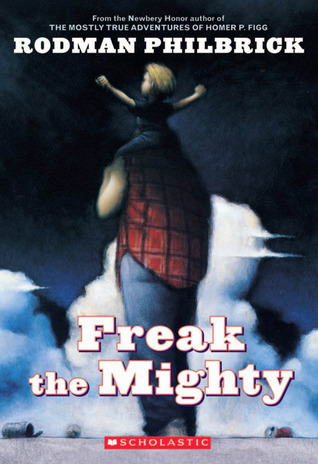 I dropped what I was doing when I saw the cover of Freak the Mighty. Was that a mutant super-villain with three arms and a teeny head, or a short kid riding a hulk-boy like a horse? Either way was going to be just fine with me. The story is told from slow-witted Maxwell Kane's point of view, and the author does an amazing job giving Maxwell a compelling voice. Through his eyes we encounter Kevin, a crippled boy who barely gets around. Turns out Kevin's also a mad genius who calls people "Earthling" and aims his space-age crutches at anyone who gets too close. I could totally imagine him pointing those crutches at me and saying, "Pew pew, I'm a robot!" Note to self: get some crutches. It seemed unlikely at first that Maxwell and Kevin would get to be friends, but before I knew it, they had organically become best buds. And not only best buds, but best buds...with a superpower. Maxwell happens to hoist Kevin onto his shoulders one day, and Kevin's brain goes into overdrive. Soon enough, Maxwell's strength and Kevin's cunning combine to form Freak the Mighty. Note to self: find someone who will let me ride them, perhaps an unsuspecting and easily-fooled blog reader. Note to self: make sure to erase that last sentence before this blog post goes live. Maxwell and Kevin, both made fun because of how different they are, get placed in the same classroom. And when a disturbance breaks out before one day, Kevin finds his way onto Maxwell's shoulders and starts chanting: "Freak-the-Might-y, Freak-the-Might-y!" At first kids look around at each other, trying to figure out if this is just plain old weird or what, but they slowly find themselves mesmerized by the spectacle. Pretty soon, the entire classroom is chanting with a crazed "U-S-A, U-S-A!" quality, and I was up on my feet, screaming along with them. The book takes a more serious turn toward the end, and I found myself blinking away a strange salty discharge from my eyes. But it was worth it to have the image of Freak the Mighty burned into my head, Kevin riding Maxwell's shoulders with their hands triumphantly punching the sky. P.S. Would anyone care for a relaxing two-legged shoulder massage? Way back in the day, when I worked at Miramax I remember working on this film (Sharon Stone is amazing in it!) and adoring it. I'm ashamed to say I haven't read the book- but I need to fix that! Thanks for a great review, Jeff! Great review, Jeff. This one is sitting on my nightstand. It's used at my kids' middle school as one of the 6th grade LA/Lit novel studies. When I saw your post this morning, I asked my now-freshman if he remembered the book. His review: "Yep. It's good." That's high praise from my man-child of few words. HA HA HA! Really funny book review. It sounds really interesting. I'm supposed to be reading this in my sixth grade English class, and now I am even more excited than before. Just finished this. Wow, that was good. Thanks for the rec, Jeff!